This watercolor was given as a gift to my good friend and parting NIFT President Ed. It was presented to him at our club's Winter Dinner. 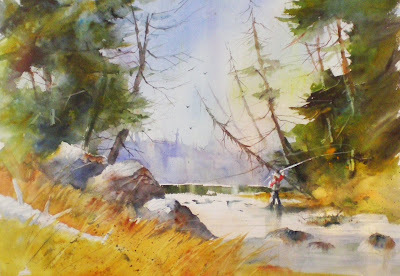 One of Ed's favorite places to fish is the Au Sable River in Michigan ( I am quite fond of it myself). Great art here. I like your painting skills! Nice blog.